There is recently a lot of discussion going on concerning the authority of Twitter users : Michael Arrington, Robert Scoble, Loic Le Meur. Some bloggers propose that the number of followers is a good measure of the authority of a Twitter user. Others argue that other elements should be taken into account, e.g. the number of retweets. A retweet is when a Twitter user copies a twitter message from another Twitter user in their network and shares it with their network, hereby mentioning the author of the original Twitter message. 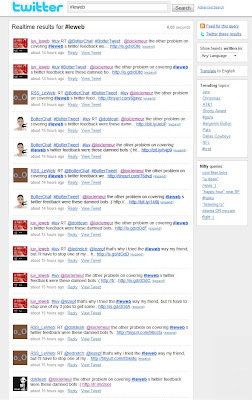 As Loic Le Meur stated that there were over 7,000 tweets for the Le Web 3 conference that was held in the beginning of December 2008, I checked the number of search results produced by Twitter Search (previously Summize). I came accross a remarkable sequence of tweets. Have a look yourself, e.g. by trying this search. One tweet (by dotdean) is retweeted by several Twitter bots, resulting in 10 additional tweets. 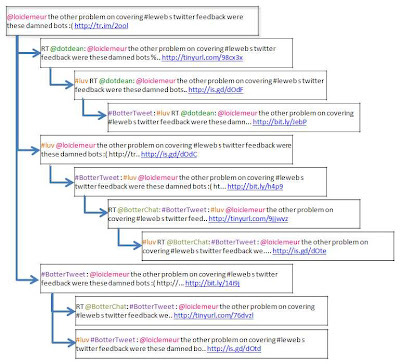 You can find the sequence of all these tweets in the graphic below. Furthermore 10 additional URL shortcuts were created : http://tr.im/2ool, http://tinyurl.com/98cx3x, http://is.gd/dOdC, http://is.gd/dOdF, http://bit.ly/14i9j, http://tinyurl.com/76dvzl, http://bit.ly/h4p9, http://bit.ly/JebP, http://tinyurl.com/9jjwvz, http://is.gd/dOtd and http://is.gd/dOte. With this example in mind, I think there are some problems by taking the number of retweets into account for the authority of a Twitter user. I have over 33 thousand tweets under my belt. You'd think that would account for something too. So you can already remove 2,000 tweets of the 7,000. A better metric is the total number of different twitter accounts that have say something about LeWeb which is 2,000. Was wondering if you've heard of iList.com? Our site integrates with twitter providing some pretty cool functionality. And also check Twinfluence to learn about social capital, velocity and other interesting metrics. I think the same everybody must go through it.